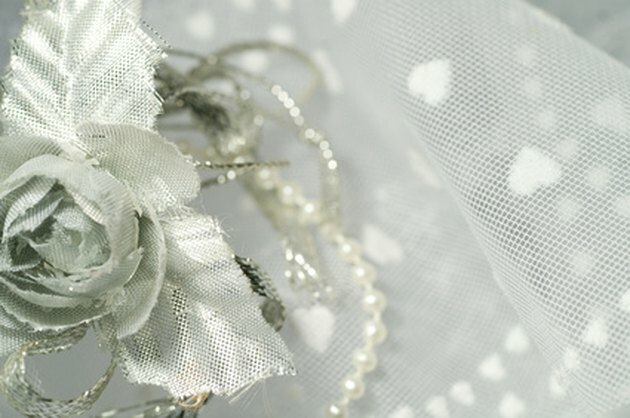 Tulle, a synthetic fabric made from rayon, nylon or silk, creates a lovely, airy effect for bridal veils, special occasion dresses, and decorations. Cleaning this delicate fabric requires gentle care and proper storage to maintain a soft crispness. Before washing the whole fabric or garment, testing a small section of tulle can indicate cleaning results. Washing tulle by hand in cool water with mild soap works well. Strong detergents and bleach should not come in contact with this synthetic. Although machine washing can work, tulle can tear by catching in zippers and other clothing hardware while agitating. The heat from machine dryers can make tulle more dry and brittle. Air-drying the fabric by hanging in an area with adequate air circulation prevents heat damage. Removing spot stains requires only gentle rubbing with mild soap and water. Vigorous rubbing could mar the netting. Pressing with a hot iron will damage or melt the tulle. A press cloth placed over the fabric acts as a buffer between the fabric and the iron set to a low heat setting for synthetics. Hanging the garment in the bathroom while a shower runs hot water will allow the steam to smooth the wrinkles; spraying a fine mist can also minimize wrinkles. Storing the garment upright or hanging in a closet with adequate space between the garments will avoid a compressed appearance. How Can I Make a Tulle Petticoat?